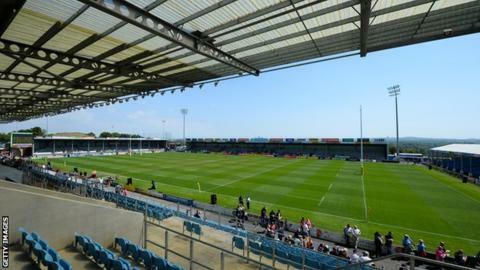 Exeter are to bid for a Premier 15s franchise and create a women's team. The 2017 champions are one of six Premiership clubs who do not have a women's top tier side. "We've started to add the ladies into our academy," Exeter chief executive Tony Rowe told BBC Sport. "So it follows now that in a year or two's time when the new licenses come out for the Premier 15s that we will apply for a licence to be one of the professional sides in England." The Premier 15s are in their second season, with 10 franchises around the country for the top tier of the sport. Current Premiership champions Saracens, as well as Harlequins, Gloucester, Wasps, Worcester and Bristol all run top-flight teams in both men's and women's rugby. Rowe says Exeter's decision to wait was to ensure the club had the right infrastructure and funding in place to support a successful women's team. "We've already laid out our plan of action to make sure we can tick all the boxes we need to tick for when the licences are available," he said. "We're not for making up the numbers, we want to hit the ground running with the women's game and we want to be competitive." Current England international Lagi Tuima was brought up in Plymouth and studies in Exeter, but plays her top-flight rugby at her nearest side Bristol. "It's awesome for anyone in the South West," she told BBC Sport. "More than anything, looking at the bigger picture it's a good foundation to have in terms of finding the hidden talent down here. "To have something like that of that stature to aspire to would be immense." The top players in the England squad are now fully professional and are scattered amongst the top flight's 10 sides. The Rugby Football Union is hopeful that they can continue to grow the Premier 15s as part of their plan to have 50,000 women and girls playing the game in England by the time of the next World Cup. "It'll be great," the RFU's interim chief executive Nigel Melville told BBC Sport. "We want to make sure we have a great geographical spread. We haven't got a team in Exeter, we've got one up in Bristol, maybe we could have one in Cornwall as well. "We're looking up in Newcastle, we're already covered in the North East and the North West, but to improve that still would be fantastic and good for the women's game. "But let's not just focus on rugby, let's look at women's sport across the globe. It's growing. There's growth in every area."